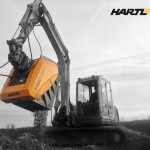 Yarwoods are specialists in Excavator Attachment Sales, Hire, Service and Repair. We also carry an extensive range of new and used attachments for sale. Yarwoods are the only authorised UK importer of TOKU Hydraulic Hammers, which are designed and manufactured in Japan. TOKU have just celebrated their 60th year of building breakers, so you can be re-assured of their high quality and typically Japanese, they are a product built to last for many years, in fact it’s not till they get a few years older that you realise how good they are, down time is very rare with TOKU hammers! TOKU Hydraulic hammers are suitable for 0.8 ton to 80 ton excavators, and at first glance the TOKU hammers look much the same as other breakers, it is the materials they are made of that makes the difference. TOKU are great performing breakers their reputation continues to grow as operators having tried TOKU brand for a couple of years are now specifying them. Yarwoods are fully commitment to this first class product and offer an excellent back up service. Yarwoods are proudly building a loyal TOKU customer base throughout the UK and now can name many blue chip companies that realise the value of longevity and service, and Yarwoods are all about that! Our satisfied customer comments speak volumes, “you can send a TOKU breaker out to work in total confidence" this customer is still running TOKU breakers in their hire fleet that are more than 10 years old. Yarwoods and KINSHOFER the German manufacturer of specialist excavator attachments for the Demolition, Scrap, Recycling, and Railway Industries have signed an exclusive supplier dealership to cover all of Scotland and the North East of England down to Derbyshire. 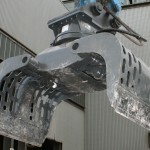 The range of products includes; Dedicated Shears, Multi Quick Processors, Pulverisers and Selector Grabs. Yarwoods currently stock a large range of both KINSHOFER and Demarec products in their hire fleet and some clients who have been hiring this range of equipment have seen the benefits and are now looking to buy for their own use. To meet this demand, Yarwoods have now put in place a sales, service and stocking facility of both KINHOFER and Demarec products where they will carry out repairs and servicing in house and have committed to an ongoing training programme for their service engineers and sales staff. The advantage of both the KINSHOFER and Demarec products apart from innovative designs, is the power to weight ratio and cycle times that increase productivity , this and the renowned Yarwoods service and back up makes us a strong contender in this field, be it for hire / sale / service or repair.